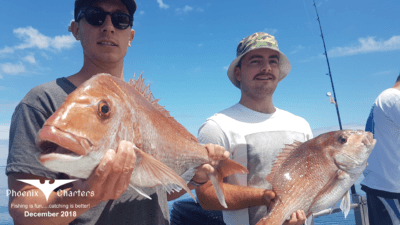 Snapper are our primary target species on our charters as they are a sought after table fish here in New Zealand. Also the abundance of this species means they can generally be found in good numbers year round. They are sought after not only for their delicious taste but also for sport as the bigger fish over 15 pounds can put up an impressive fight even for the most experienced angler. Kingfish are well renowned as one of the hardest fighting fish for its size in the sea. 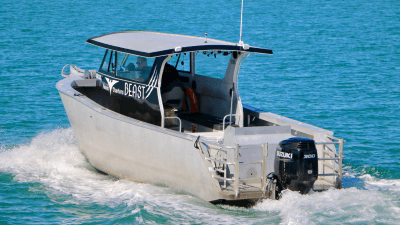 The best time to target Kingfish in the Hauraki Gulf is from November through till May as the water starts warming up. We generally catch these fish on Slow Jigs or Mechanical Jigs while out in the deeper water and either Live Baits or Stick Baits when shallower or around the reefs. When caught on our light slow jig setups they make for a real challenge. John Dory are one of the most tastiest fish in the sea according to our skipper and most that have tried it have rated it very highly. 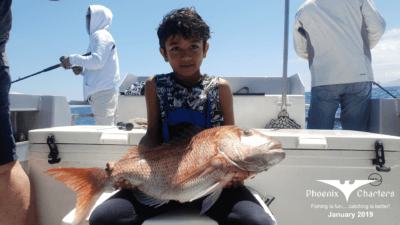 Unfortunately these fish are less abundant as Snapper and don’t put up much of a fight when caught (more like a bucket of water being lifted up) so are generally caught as a by-catch when live baiting for Kingy’s or occasionally on slow jigs in the deep. Trevally are a very welcome by catch when fishing for Snapper. We often pick them up whilst straylining for Snapper over winter. But in summer time they can be targeted on the local reefs or channels with softbaits and slow jigs. When caught on light gear the Trevally fight very hard just like the Kahawai but with a much better taste similar to Snapper. They are also prized as one of the best fish for Sashimi (Raw Fish).